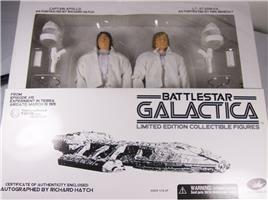 BATTLESTAR GALACTICA IS BACK, with a new TV series on the Sci-Fi Channel later this year; and Majestic Studios is back with 12" collectible figures from the original classic Battlestar Galactica TV show from the 70's.All your favorites will be here: Richard Hatch as Capt. Apollo, Dirk Benedict as Lt. Starbuck, Lorne Greene as Commander Adama and more to follow. The villainous Cylons will be represented by the famous chrome robot and the equally evil gold robot.Galactica follows the travails of the 12 colonies of mankind after their new hope for peace with the robotic Cylon Empire ends in the largest military sneak attack in the history of galactic warfare, leaving 12 worlds of mankind utterly destroyed. Surviving citizens of these worlds are forced to take flight into the unknown under the wing of their race's only surviving warship, a 4,100 ft. long carrier craft named the Galactica.Their only hope is to find the mythical planet Earth, the supposed 13th colony of Mankind, lost millennia ago when humans first left the mother world, Kobol. Author Erich Von Daniken's 1974 best selling book, Chariots of the Gods, heavily influenced the series. The book presented his theories that the Earth was visited by extra-terrestrials some 10,000 to 40,000 years ago.While the aliens were here, Von Daniken suggests, they built the great pyramids in Egypt, laid down airfields that can still be seen today in Peru, and interbred with early humans to produce Homo sapiens. As evidence, Von Daniken points to legends seen in cultures around the world that tell of winged gods or flying machines. Is this Galactica's lost colony?The plotlines of Galactica often involved universal themes such as political corruption, class division, mass starvation, and religious fanaticism, but never lost sight of personal stories about family and romance. This group of people who are forced to draw a line in the stars and fight back when odds are against them caught the imagination of the TV viewers.John Dykstra's Impact on Popular Culture -The special effects in 1977's STAR WARS spurred many movie &amp; TV producers to explore outer space. It signaled that ultra realistic FX were now within the reach of every major motion picture studio. It even reinvigorated the STAR TREK franchise, which released its first theatrical film, Star Trek The Motion Picture, in 1979; and continues today with TV's Enterprise.The first major impact of Star Wars was seen at Universal Studios in 1978 when Exec. Producer Glen A. Larson joined with the FX wizard from Star Wars itself, John Dykstra, to create the epic survival saga Battlestar Galactica for broadcast on ABC-TV.Much of Star Wars' and Galactica's FX impact was due to Dykstra's camera hardware knowledge and having studied industrial design in college. He created the ‘Dykstraflex' system, which was the first computer-controlled motion control camera. All of today's in-camera special effects are based on this system, which can remember multiple movements from miniatures and/or live actors, and allow seamless integration of the two or more images.